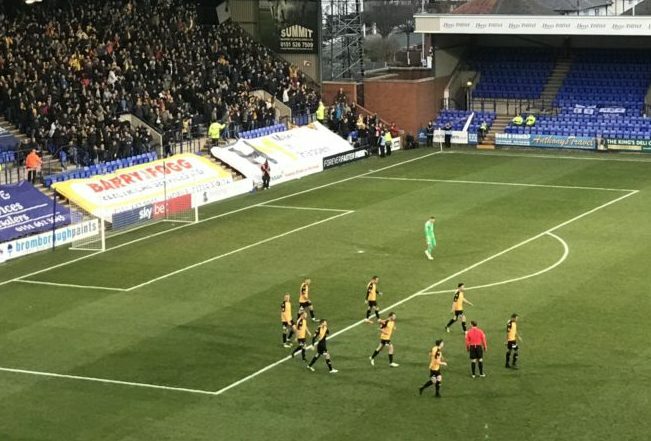 A dream FA Cup third round tie at home to Tottenham Hotspur is the glittering prize awaiting two local rivals, as Southport FC are plotting a famous shock against Tranmere Rovers after forcing them to a replay. A total of 21 miles and 56 football pyramid places separate the two teams, but on Sunday nothing could come between them as they met in the second round at Prenton Park. Brad Bauress fired Southport to within just 90 minutes of ending their 50-year FA Cup third round absence. The midfielder’s 30-yard strike 20 minutes from time secured the Sandgrounders a deserved replay in a well-fought 1-1 draw with League One side Tranmere. Jonny Smith put the hosts ahead in the first half, nine minutes after entering the field following an injury to Dylan Mottley-Henry, but the favourites failed to bury the resurgent non-league side. However, a defiant second-half display from Liam Watson’s side earned them another bite of the cherry in a week’s time. The replay, which is due to be played on Tuesday December 11 at Southport’s Merseyrail Community Stadium, sets up the mouth-watering spectacle of one of the two Merseyside teams taking on Harry Kane’s Spurs next month. Already deemed the lowest ranked team in the cup, National League North side Southport went into the hat with the elite outfits in England’s top flight, hoping to achieve a major scalp, if they can overcome their local rivals. No doubt Tottenham at home will be an adequate consolation. For Rovers, the draw adds to the unwanted FA Cup record of not beating their Merseyside rivals in their last five matches, with recent form showing they have won just one of their last five competitive games.